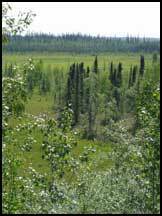 In February 2009, Fountainhead Development Inc., one of the largest real estate development and hospitality companies in Fairbanks, donated 89 acres of land to the Chena Flats Greenbelt Project. The new parcel, which extends for approximately one mile along Chena Pump Road, is a vital acquisition for the Greenbelt Project, whose goal is to establish a multi-purpose corridor along the base of Chena Ridge that provides accessible recreation space, conserves high-quality wetlands, enhances surface- and ground-water quality, and protects a portion of the historic Chena town site. Fountainhead Development owners Tim and Barb Cerny are excited about the land’s year-round recreation potential and its value as an access point to the proposed greenbelt. “We hope this land will some day serve as a hub for the recreational corridor,” says Mr. Cerny. Mike and Kathy Craft hosted a gathering at their home on Pickering Drive on Sunday, December 7, 2008 to support the Greenbelt Project. Neighbors came together to meet each other, to learn more about the Greenbelt, and to brainstorm about continued fundraising and volunteer activities. Many thanks to the Crafts for providing a delicious spread of food and to Bob Henszey for an informational slideshow. With the assistance of The Conservation Fund, the Interior Alaska Land Trust recently acquired eight lots (about 20 acres) in the Despain Lane area (off of Chena Pump Road near Faith Baptist Church) for inclusion in the Greenbelt. The lots in this area are about 2.5 acres each, with 20 parcels north of and 10 parcels south of Despain Lane. Many of these parcels have not yet had homes built on them, but are platted with that possibility.The property added to the Greenbelt contains an old slough channel of Cripple Creek, as well as scrub-shrub wetlands. Some residents of Sherwood Forest use this land for winter walks or skiing. We are very pleased to have acquired these parcels, which will make it easier to include a continuous greenbelt through the area. The CFGP is currently working with other landowners interested in subdividing off the wetland portion of their properties and selling that portion to the Greenbelt. These are very important parcels. The Greenbelt is also interested in working with landowners who would like to retain all of their property, but may be willing to sell some of their development rights to the Greenbelt in a conservation easement. There are federal tax benefits (the value of the easement is considered a donation to a non-profit organization) and, likely, Borough tax benefits to this option (your FNSB property taxes will likely be reduced as a consequence of the easement). Please contact Sally Andersen at 479-4345 or chenaflats@gmail.com if you would like to learn more about conservation easements. We have also recently acquired an additional 17.5 acres in the northern section of the proposed greenbelt area with the assistance of The Conservation Fund, and have had offers from other interested landowners. Further local fundraising efforts are underway. We can use your help! We continue to follow two new area subdivisions that have been in the works for about a year now. One is along Roland Road, and the other is off of Chena Point Avenue. The Roland Road subdivision was two, 20-acre parcels originally subdivided into 18 lots ranging from 1.84 to 3.08 acres, and was recently approved to be further subdivided into 34 lots about one acre each. These parcels have been previously cleared and are on the edge of the proposed Greenbelt, thus we don’t believe they are essential to the Project. We hope to work with the developer to find ways that both the development and the Greenbelt can benefit from each other. About ten acres on the south side of Chena Point Avenue was recently permitted by the Army Corps of Engineers for six home sites (which is now offered for sale as part of a 20-acre parcel) along with another 20 acres in the original 53-acre parcel. These lands would make a nice addition to the Greenbelt, but will need the financial help of local residents to make this happen. 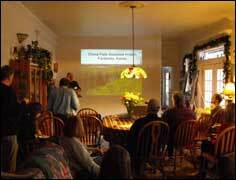 Held Saturday, March 8, 2008 at 1pm to celebrate the preservation of nearly 200 acres of open space. Nine people spent 1.5 hours getting to know the area and exploring the trails of the Chena Flats Greenbelt Project. It was a beautiful sunny day with unseasonably warm temperatures of close to 40 degrees. Fun was had by all! The Chena Flats Greenbelt Project has received a national honor accompanied by a grant from the Kodak American Greenways Awards Program. 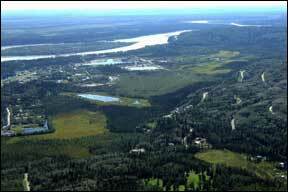 The $1,500 grant will help preserve open space, wildlife habitat, and recreational opportunities in west Fairbanks (at the base of Chena Ridge). In addition to receiving the grant award, the Chena Flats Greenbelt Project will be showcased as a national model for its innovative efforts to develop a greenway in Fairbanks. 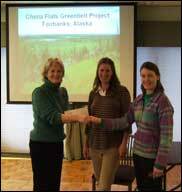 Kris Hoellen from the Conservation Fund giving Sally Andersen and Martha Reynolds the Kodak check at the Green Infrastructure Workshop in Fairbanks, February 11-15, 2008. Photo courtesy of Bob Henszey. Listen to former project coordinator, Marie Beaver, talk about our citizens’ effort to protect greenspace during an interview with KUAC Radio on May 11, 2007. 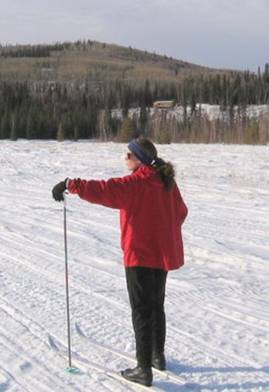 In April, 2007, Dave Lacey of the Nordic Ski Club of Fairbanks led a group of cross-country skiers on a tour of the trails in the Chena Flats area. 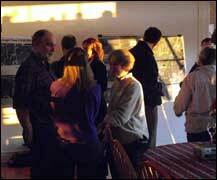 The Chena Flats Greenbelt Project held a fundraiser auction and brunch on Sunday, March 4, 2007 at Pike’s Waterfront Lodge. On a cold, not-yet-spring day, 45 people turned out to support and learn about the Greenbelt Project and linger by the fire at the Lodge. At the end of the day we had raised over $5000, funds that will be put towards pursuing and purchasing further properties and land conservation easements within the envisioned greenbelt.